It’s a week into the new year and by now the novelty of any resolutions have probably worn off a good bit. Now’s the time to reevaluate what is important, what is manageable and realistic when it comes to your goals. I didn’t post this on the first on purpose. I wanted to really spend this week thinking about how to make this year different. I am notorious for jumping on and rolling off the bandwagon. My ride has always been bumpy and hard and uncomfortable when it comes to working on my health. This year, instead of jumping in with both feet, I wanted to take small bites and really focus on just one thing at a time. 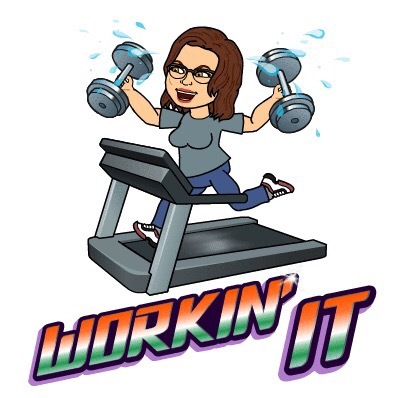 So, I decided it would be awesome to have a weekly focus where I just add one thing at a time to build on healthy habits, much like I’ve done while paying off my debts and let those little things snowball into one huge success. No more soda- this is huge for me! I can stop drinking it for awhile but one sip and I just can’t get enough again. I’m a big diet soda fan and my main problem is not the soda itself but rather what I eat with it… You know, salads just don’t go as well with soda as burgers do! No more takeout. None. All meals prepared at home! Eventually, there will be exceptions for special occasion, sit down dinners, but learning not to use fast food as a crutch will be amazing! This will be especially important at lunch! Eat at least 4 servings of produce per day. Exercise at least 10 minutes, four times a week. I just bought a bunch of DVDs and some light equipment and one of the things that stood out was the “getting started advice:” if you do the workouts for just 10 minutes, four times a week, you’ll build a habit and great form to expand on later. Start eating at the table. No more mindless TV munching. Have a nice meal! Eat at least 5 servings of produce. Walk at least 10,000 steps a day. I just bought a fitness monitor and I get close on busy work days but don’t even hit half that on days I’m home! Cut out sugar. All added sugar in any form must go. Nothing with sugar or any sugary substitutes allowed. This includes sweetened processed foods! Buy organic fruits and veggies. Start drinking coffee black. Or tea. Up workouts to 5 times a week, 20 minutes. Cut carbs down to only 25% of the plate. No more carb-overload, keep the plate half full with produce and 25% protein! Use smaller plates. Get a set of salad plates to keep portion sizes on check. Increase workouts to 30 minutes. Increase produce servings to 6 per day. Start eating 5 mini meals instead of 3 large ones. Start walking at least a mile at one time, 3 times a week. Only drink water, coffee (1 cup) or tea. Increase produce to 7 servings per day. Cut out white flour. Replace with whole wheat or other minimally processed items. Cut alcohol to just special occasions. Cut carbs to just 3 meals. Nothing processed anymore- all food from scratch. Up mileage to 1.5 miles. Increase produce to 8 servings. Be able to wear single-digit dress size! Be able to wear a two-piece! Sleep at least 8 hours a night-follow the same wake-up/sleep routine every day. Throw out the scale and buy a new wardrobe- you did it and you’re amazing!!!!! I know if I can follow this plan and let it snowball, I’ll be propelled to success! Follow along with me as I share my journey weekly! You can do it!! Great ideas for me too. Reading my own diet book now. 2016 will be our year!!! !